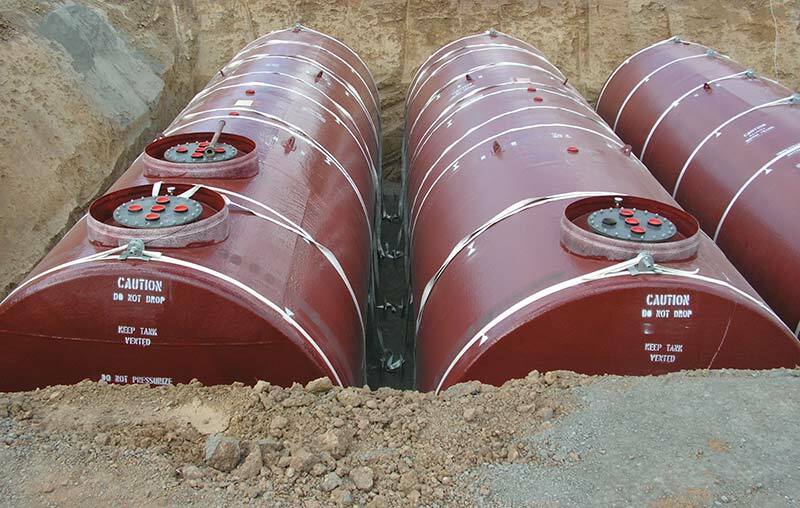 Tank Solutions are market leaders in the manufacture of Glasteel II ® Underground Fuel Tanks. This quality fuel storage tank ranges in size from 2000L to 110,000L with many different compartment configurations available. We offer 1200mm standard FRP risers with 600NB manways c/w 5 x 100NB BSP threaded sockets to suit the traditional retail pressure system. We also have a 1500mm FRP riser option for large capacity submersible turbines and some oil company specifications. Glasteel 11 ®Underground Fuel Tanks are made from welded mild steel with an FRP outer layer as secondary containment and leak protection. The FRP outer containment also provides corrosion resistance and eliminates the need for cathodic protection. The Glasteel 11 ® range is suitable for all products inclusive of blended fuels, ethanol and biodiesels along with many differing chemicals. A full range of internal tank liners can meet your most demanding applications. Each tank is fitted in the factory with a vacuum gauge on the interstitial space to monitor your tanks integrity.